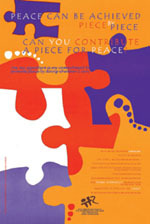 To raise awareness about peace, non-violence and peaceful conflict resolution. To think about how we live surrounded by violence and how we accept this as normal. To work for peaceful resolution to problems. To encourage thinking about practical ways in which children can contribute towards promoting peace.